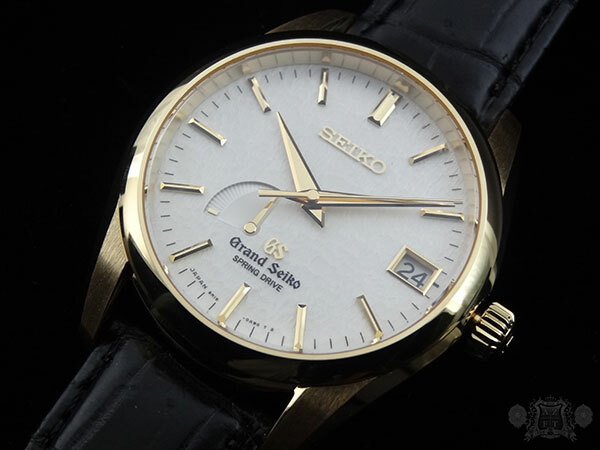 As a special tribute to one of the most popular Grand Seiko’s in the line up today, the SBGA011 “Snowflake”, Seiko has introduced a series of limited production models in 3 shades of 18k gold. Available in white, yellow or pink gold, with the very special 9R15 caliber, only one of each color came to the US market and can exclusively be found at AZ Fine Time. 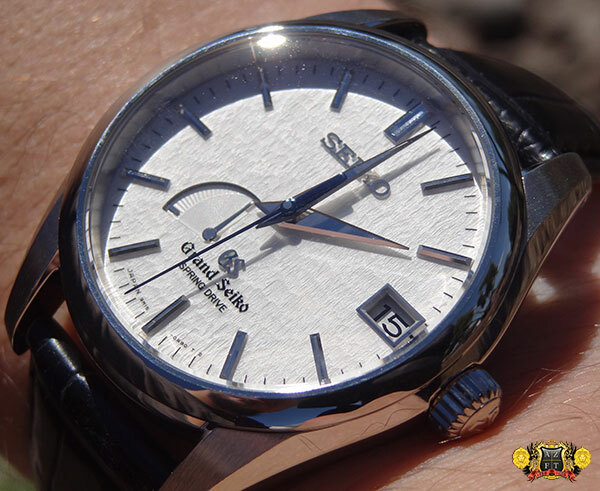 Today we bring you the white gold, SBGA089. The Snowflake was made to pay tribute to the winters of Spring Drive’s hometown and birth place, the Suwa Nagano region of Japan. In Suwa, the Shinshu Watch Studio manufactures and assembles Spring Drive movements. The winters in this central region of Japan produce light and airy snowfall, which creates snow drifts on the ground and mountainous area. 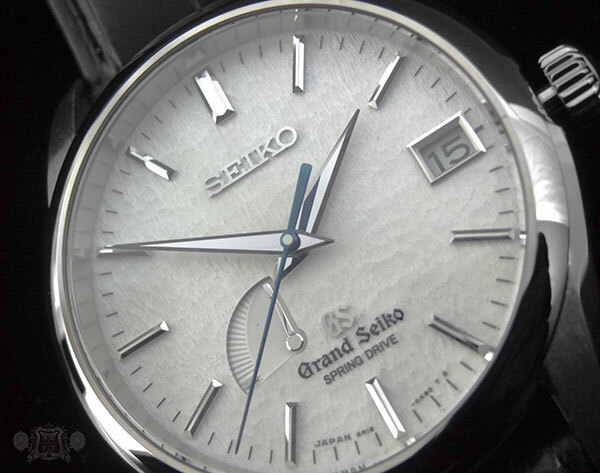 The dial of the snowflake is made to mimic this, but still retain the subtlety and beauty you find in Grand Seiko. 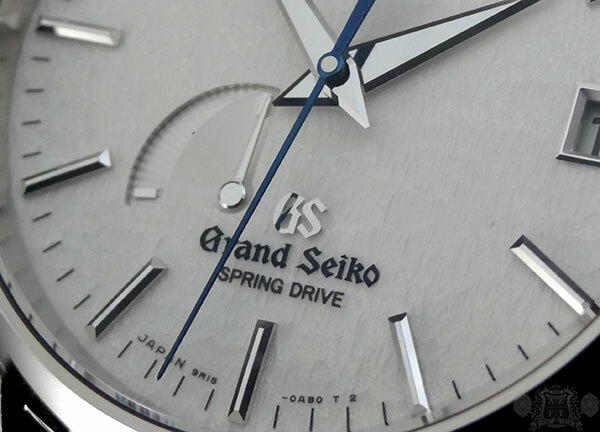 From a distance the dial appears to be a plain white, but up close, the intricate details can easily be seen. 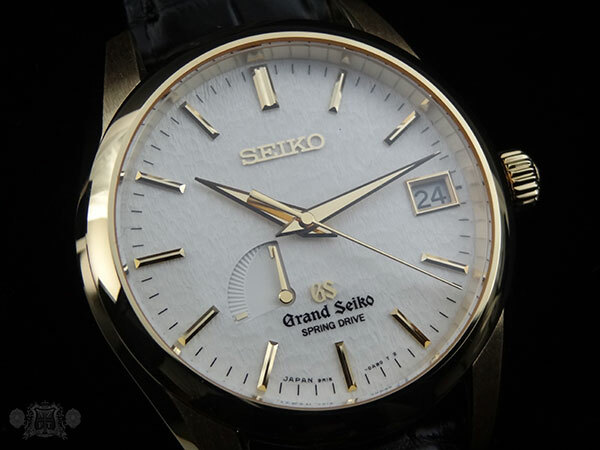 The concept of Spring Drive conceived in 1977 by a young engineer at Seiko’s Suwa plant, Yoshikazu Akahane. 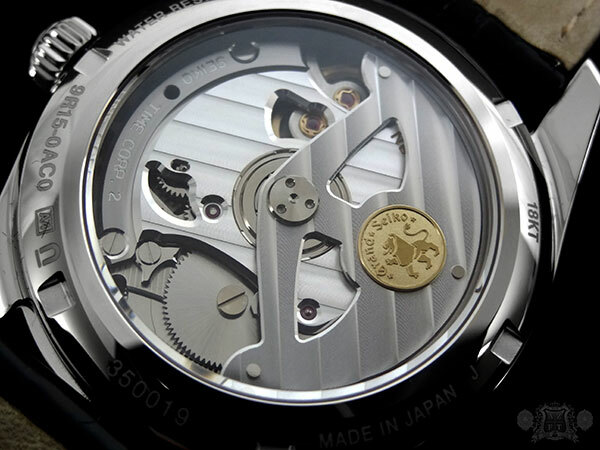 The thought of a perfect watch, having the craftsmanship and details of a fine mechanical but the accuracy of the best quartz, was something Akahane became devoted to. 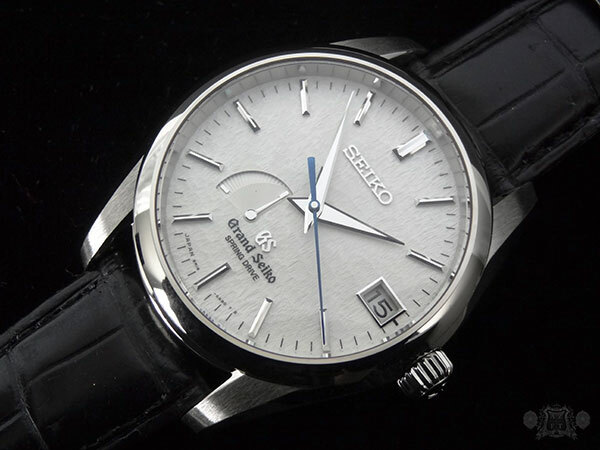 After 28 years, 600 prototypes and 230 patents, Seiko’s Spring Drive was finally introduced to the market in 2005. The Spring Drive caliber found in this special Snowflake is the rarely seen 9R15. This caliber is only used in limited edition/production type models as its Tri-Synchro Regulator utilizes a specially selected quartz crystal that endures vigorous testing and aging to ensure it is of the finest quality. 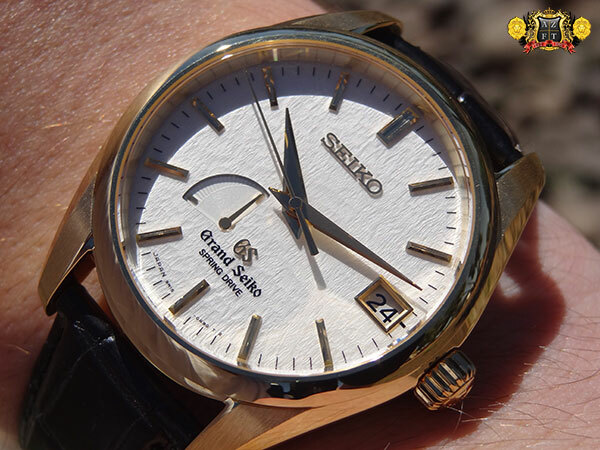 These rare quartz crystals are what provide the 9R15 with an even higher accuracy compared to the 9R65 found in most Grand Seiko’s. The 9R15 is rated to only +/- 10 seconds a month deviation as compared to the 9R65’s +/- 15 seconds a month (equivalent to 1 second a day). As you will find with the 9R65, the actual accuracy of the 9R15 is likely to be much better than its rating. This is the 1st and only 9R15 caliber to come to the US market. 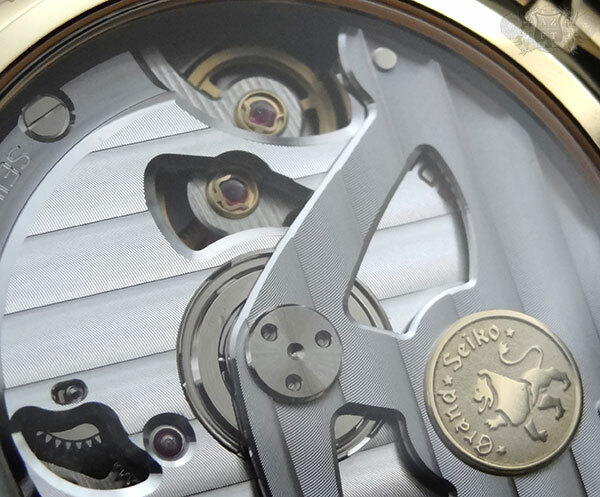 This movement, which is manufactured completely in house, has a 72 hour power reserve and an 18k gold medallion on the rotor to express its uniqueness. The SBGA089’s 18k white gold case is slightly smaller than the SBGA011’s case at only 39mm wide but the same thickness of 12.5mm. The finish is brushed at the lugs but mostly composed of the impeccable Zaratsu “Blade” polishing technique, giving the mirror like finish that is truly stunning in person. The hands and indexes also utilize this polishing technique on their multifaceted, diamond cut design, which gives a brilliant sparkle from every angle. As I mentioned before, only 1 of each color of gold came to the US market and are exclusively sold at AZ Fine Time. 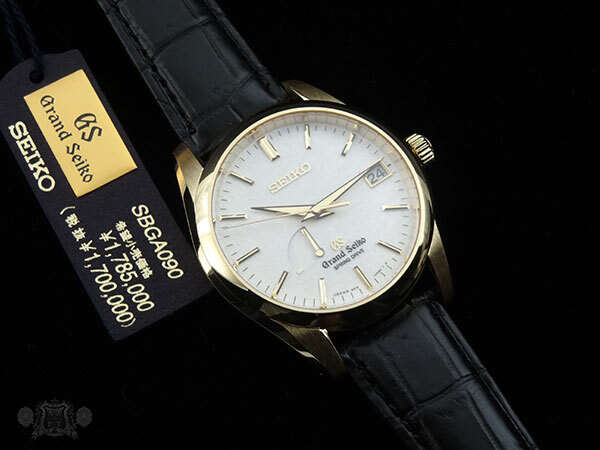 The MSRP for the white gold SBGA089 is $19,000. If you have any questions, please feel free to call us at 1-800-486-3996 or submit an inquiry through our site. 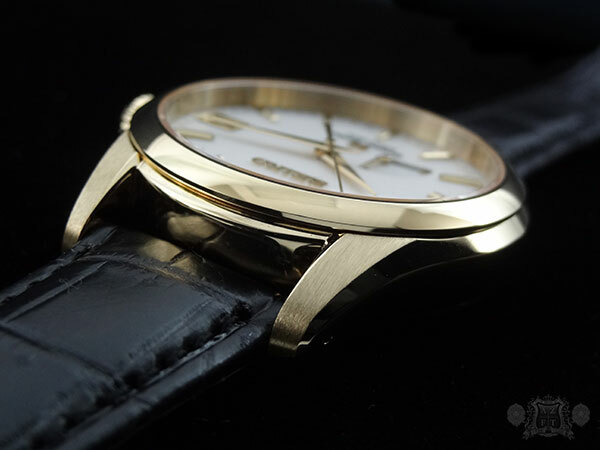 Stay tuned for our reviews on the yellow gold SBGA090 and pink gold SBGA092. 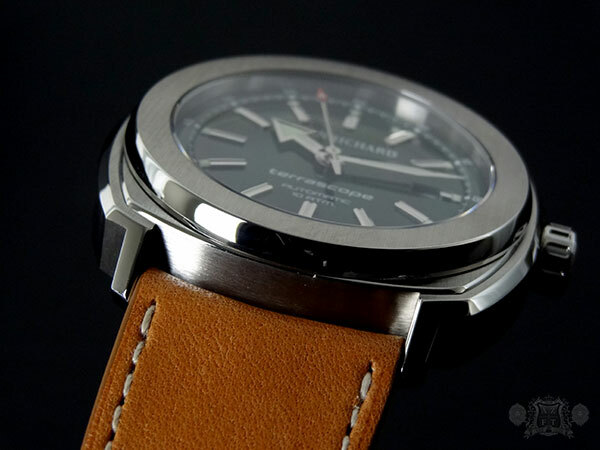 The introduction of the revamped JeanRichard brand for 2013 brought forth a variety of beautifully designed timepieces, inspired by land, air and sea, that not only boast in a high quality product , but also in excellent price points. 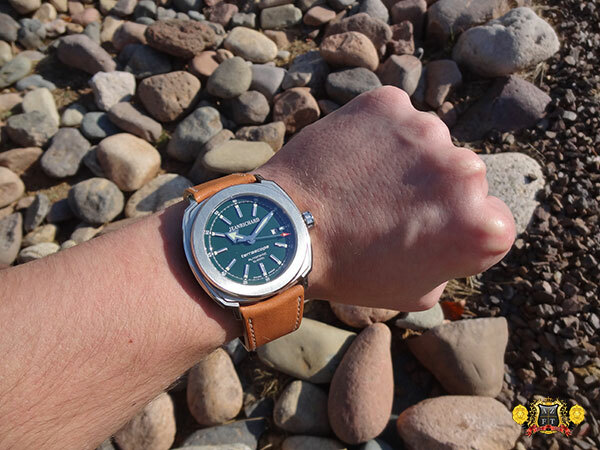 Today we review one of the most unique in their land series, the Terrascope 60500-11-A01-HDC0. 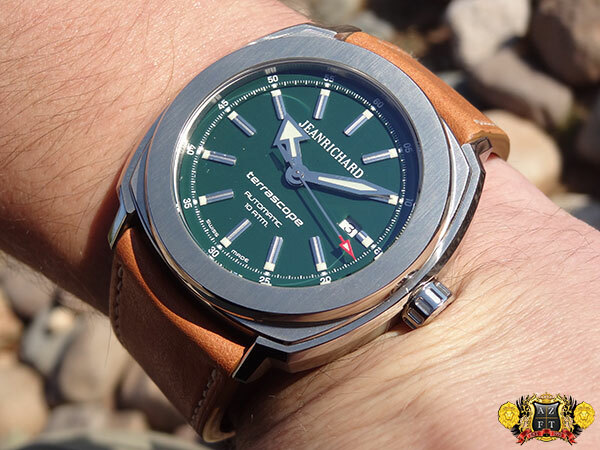 The first noticeable trait of this model is its gorgeous green lacquer dial. 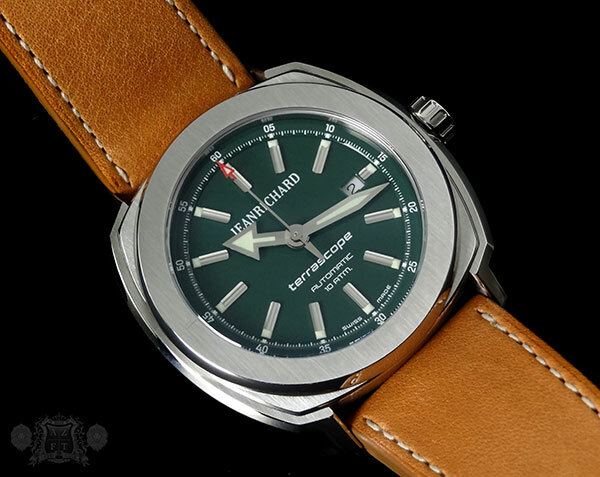 The dial color is very reminiscent of British Racing Green and along with its caramel colored vintage calfskin strap, it easily makes you think of Jaguar’s most iconic, classic cars. Just as you’ll find on the cars, the dial color has a wonderful spectrum of color depending in lighting, growing darker as the light dims until it almost reaches black. 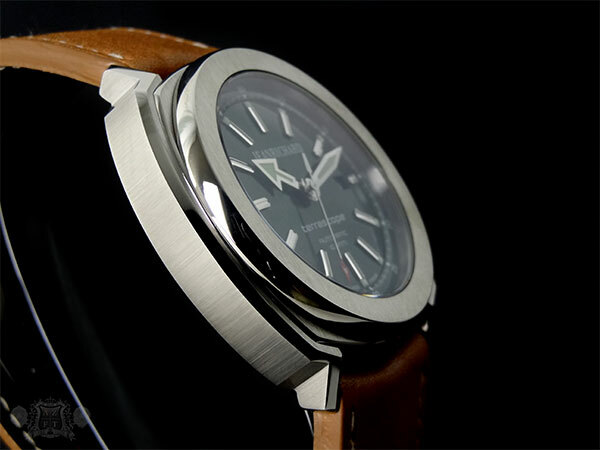 The complex 44mm case design is 12.6mm thick and magnificently finished. With about 25 parts just for the case construction and over 70 steps to manufacture, finish and assemble, this intricate, cushion shaped design is crafted to impress and truly does so in person. The finish is a combination of a mirror like high polish that has an incredible shine, as well as vertical satin finish that adds a fine detail but will also do a nice job hiding hairline scratches. 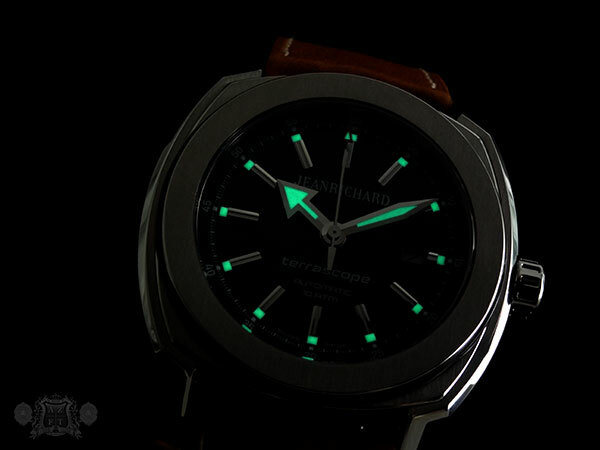 The movement found in the Terrscope series is the JR60, which displays 3 hand time and date. 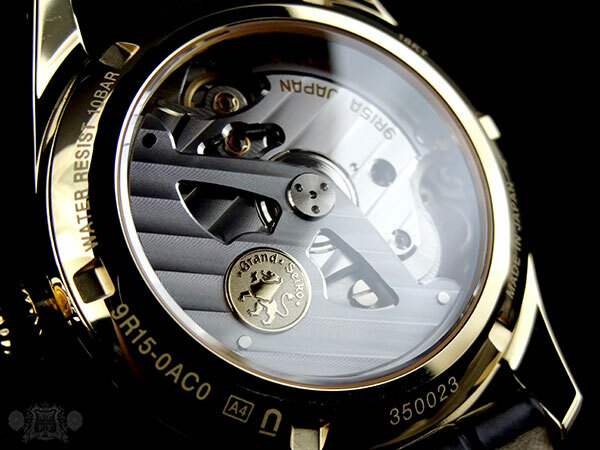 The movement has 26 jewels, a minimum power reserve of 38 hours and a rate of 28,800 bph. 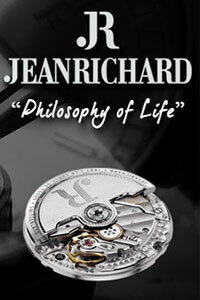 This is one of JeanRichard’s “industrial movements” meaning it is not their in house manufactured JR1000 series, but is a base movement that has been assembled and modified at their factory in La Chaux-de-Fonds. The hands and indexes are rhodium coated and have a beautiful shine. This does make for better legibility in darker settings, but the luminova applied to all 12 indexes and 3 hands, make for easy night time reading. 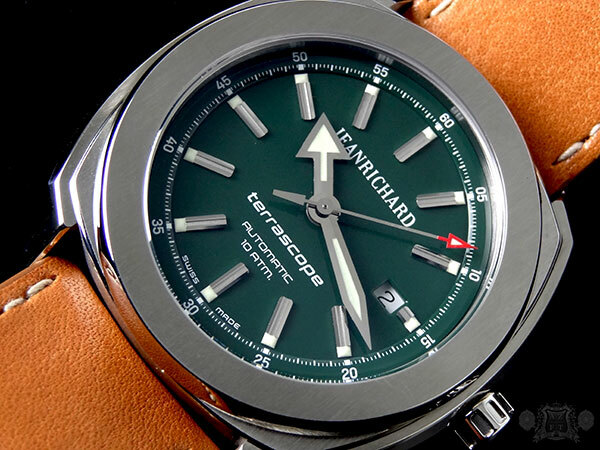 The MSRP on the JeanRichard Terrascope Green Dial 60500-11-A01-HDC0 is $2,900. 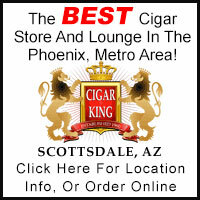 As always, if you have any questions, please feel free to call us at 1-800-486-3996 or check us out on AZFineTime.com. 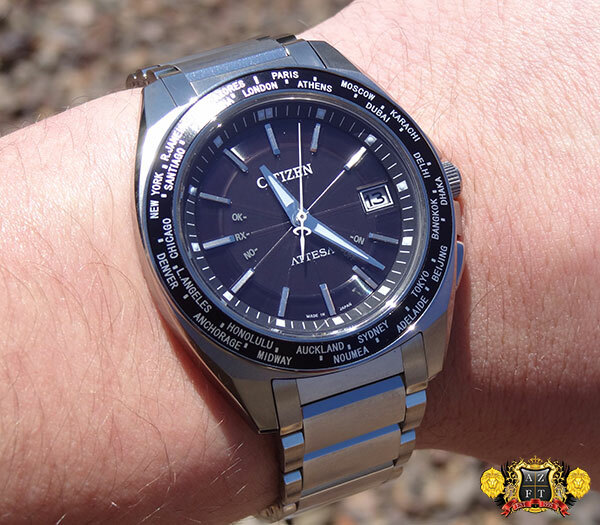 Continuing our introduction to the newest addition to the AZFT lineup, Citizen Attesa, we bring you one of their less complicated models, ATD53-3091. The needle indication Direct Flight model is a simple three hand, with great features displayed in simplistic form. This Attesa’s range of features include being radio controlled, solar powered (due to Citizen’s Eco-Drive technology) and perpetual calendar. The RC feature is very easy as the watch will automatically attempt to connect to the radio signals around 2am automatically (as long as you have it near a window). You can check to see if your connection was successful by pushing the lower right button. 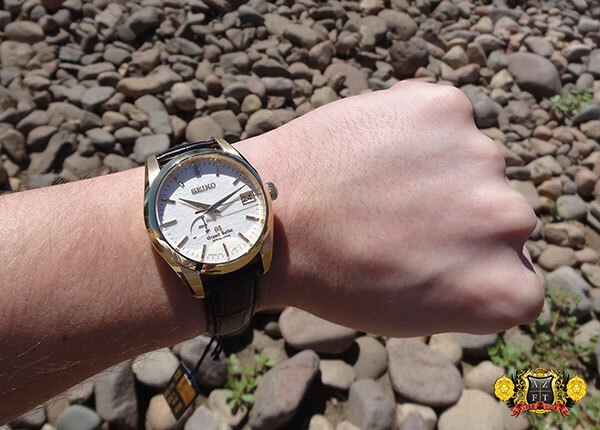 If you hold down the lower right button for 2 seconds or more, the watch will then attempt to receive signal manually. The Direct Flight feature makes for easy time zone adjustments by pulling out the crown one click. From there, the watches second hand becomes a city code indicator. Turning the crown will change the city codes, and the hands/date will adjust automatically to the appropriate time. 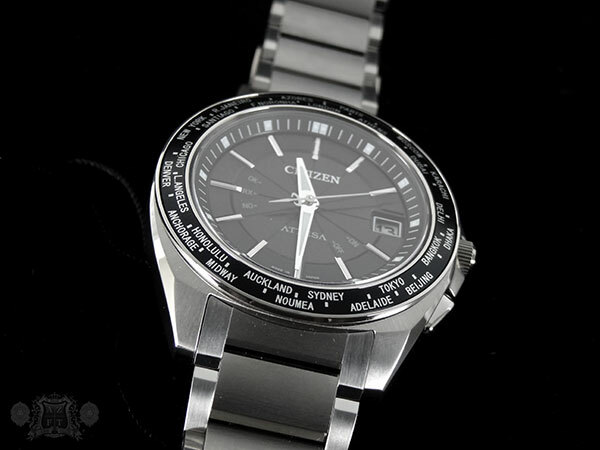 The 26 city codes are large and easy to read on the bezel, which is very convenient. The daylight savings can also be adjusted by pulling the crown out to the second click and turning the crown to turn daylight savings on or off. This model has a sporty but elegant design at 42mm wide, only 9.7mm thick, and weighing in at only 84g, is extremely comfortable. 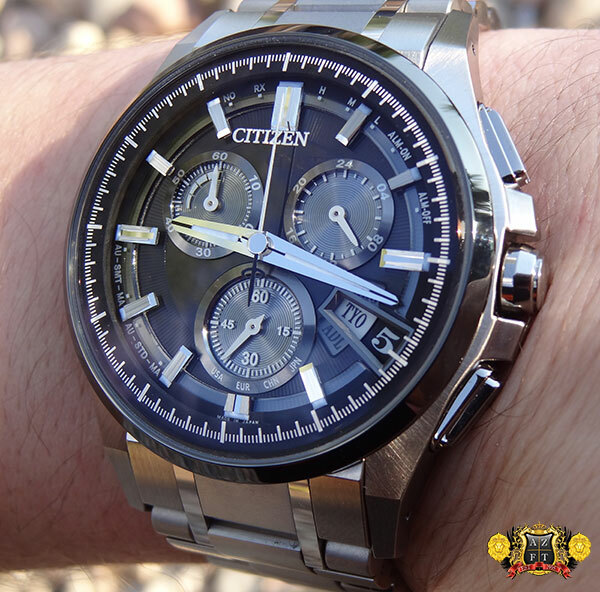 The weight is due to the use of Citizen’s proprietary Super Titanium, which is about 40% the weight of steel, stronger and has low nickel content, making for less or no allergy problems. The fit and finish is very intricately done and has a wide variety of styles. The center links are a brushed horizontal finish, while the outer links are vertical. This gives the appearance of 2 tones on the same metal. There is also a sunburst brushed finish on the front part of the case, while the tips of the lugs are vertically brushed. 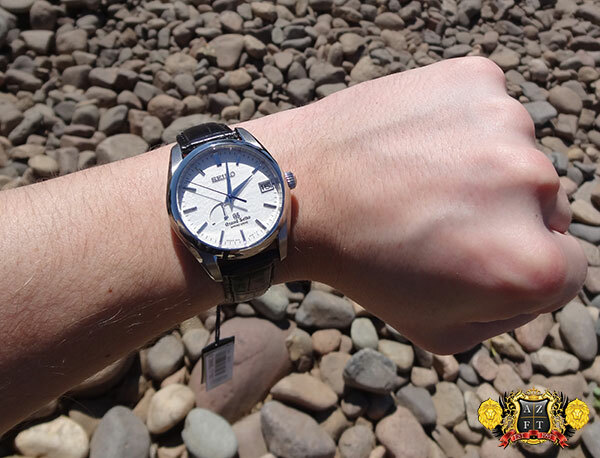 On top of that, they have small amounts of a high polished finish that give the watch a beautiful and distinct shine. 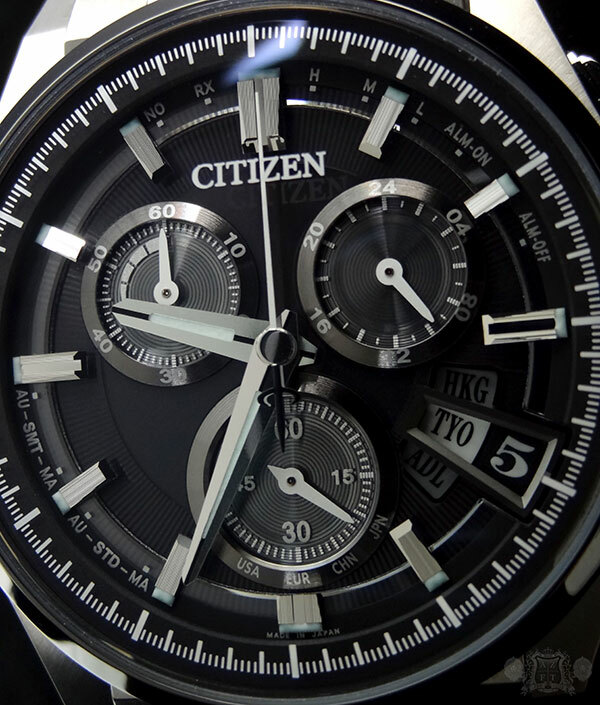 To protect this beautiful finish, Citizen’s proprietary Duratect coating is applied, making the watch about 4 times harder than it would be without it. To add to its durability, it also has a sapphire crystal with anti-reflective coating. Some other incredible attributes of this piece are its power reserve, lasting up to 2 years in the dark in sleep mode before needing to be recharged. 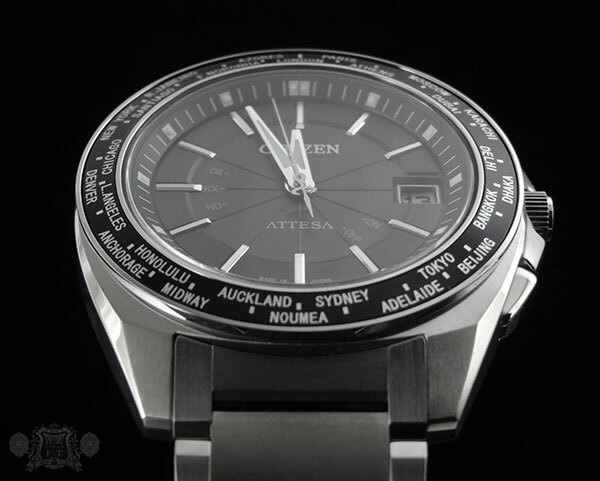 This, along with all other Attesa’s, has a shock detection and needle correction feature, making sure that the second hand always line up perfectly with the indexes. To add to its ease of wear, the watch has a micro-adjustable clasp that can be done without tools and even while on the wrist. This allows for 3 different adjustments easily, should you have a change in wrist size due to temperature or any other reason. Since Attesa is only available in small quantities and styles, these models will not be listed on the AZFineTime.com site. We are the 1st and only official dealers of this line in the US, and are very happy to finally have them here in our store. If you are interested in this model or the 4 other models available in the line up, please call us at 1-800-486-3996 or inquire by email through our site. 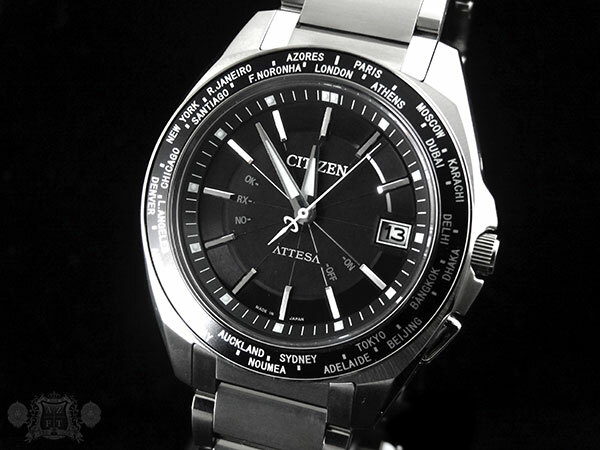 AZ Fine Time is proud to announce that we are now the 1st authorized dealers for Citizen Attesa in the US! 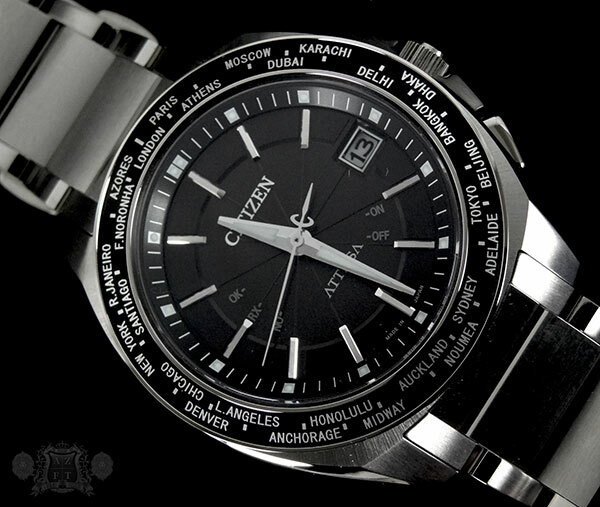 For those who are not familiar, Citizen Eco-Drive Attesa is a premium brand that Citizen Watch Co. started in 1987 and has typically only been sold on the Japanese Domestic Market. The piece in today’s review is the 2012 Good Design Award winner in Japan, the BY0094-52E. 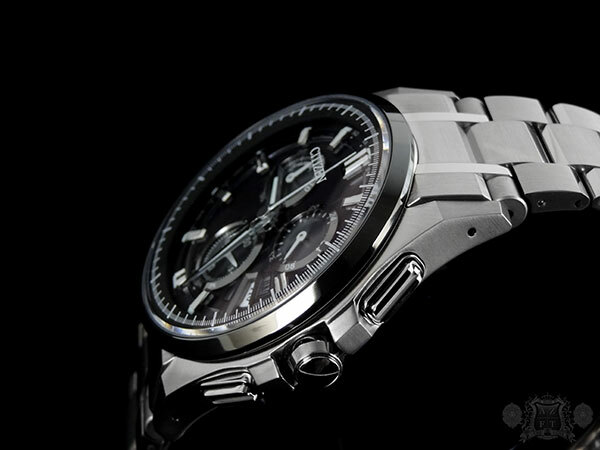 This model features Citizen’s Direct Flight technology which allows the user to change timezones simply by pulling out the crown one click and turning. The exposed city code indicated at the 4:00 will turn and once you reach your desired city (of the 26 to choose from), the hands will automatically adjust themselves to that timezone. You can adjust for daylight saving to be automatic or manual, and on or off by pushing the lower right button with the crown out one click. This piece is also radio controlled and syncs to the stations located in the US, Japan, Europe and China. The watch has an automatic receive in the middle of the night or you can manually receive signal by holding the lower right button for 2 seconds. You can also check to see if you successfully received signal on the last attempt and how strong the RC signal is. With the updates, this piece will have perfect accuracy all the time. 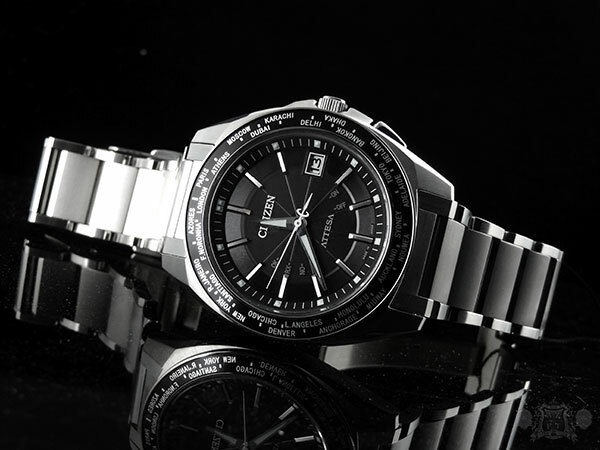 This model is Citizen’s solar powered Eco-Drive technology, which can go a maximum of 4 years in the dark from a full charge in sleep mode. Without going into sleep mode, it will last about 8 months without any light. There is a power reserve indicator at the 10:00 area which can be read after pushing the lower right button. 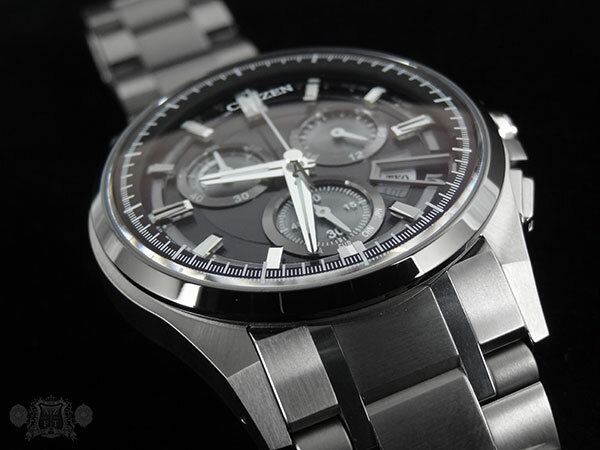 Otherwise, the sub-dial is the minute counter for your chronograph. 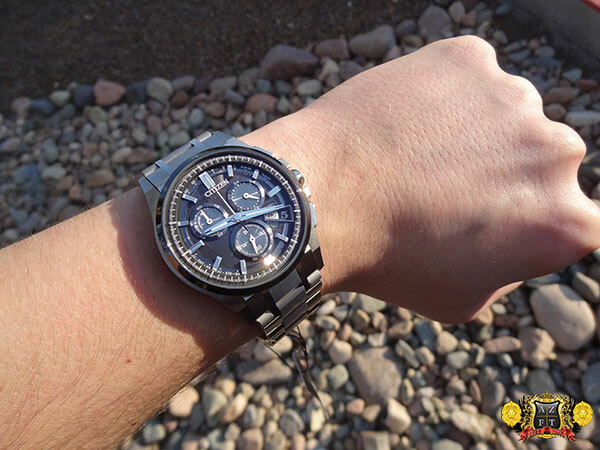 The chronograph acts as most others, starting and stopping using the upper right button and reseting with the lower right button. 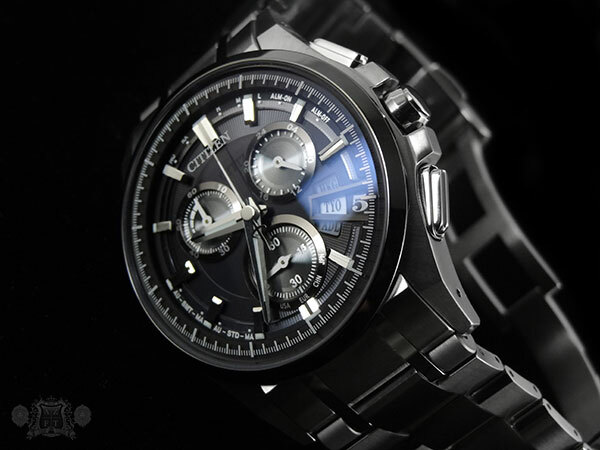 The chronograph can measure anywhere from 1/5th of a second up to 60 minutes. The actual seconds will be counted at the 6:00 sub-dial and there is a 24 hour counter at the 2:00 sub-dial, which indicates AM or PM for the main clock. There is also an alarm on this piece that can be set and activated by pulling the crown out two clicks. To set, the minute hand is adjusted 1st independently by turning the crown and you can then adjust the hour hand by pushing the upper right button and turning the crown. You can also turn the alarm on or off by pushing the lower right button. Once the time is set for the alarm, you can close the crown and the alarm will sound for 15 seconds after reaching the set time. You can turn the alarm off by pushing either the upper or lower right button while it is sounding. The case and bracelet design on this Attesa are truly impressive. 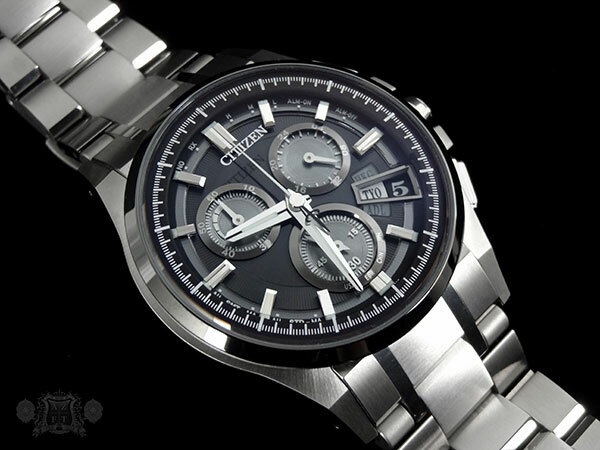 They utilize Citizen’s Super Titanium alloy, making for a light weight but durable case, and also plate the watch in Duratect coating. Duratect provides greater scratch resistance as it makes the material about 4 times harder then its original form. The multifaceted design is very sharp and bold, giving for a great play off of light and shadow. The finish is what really gives a stunning impression, utilizing horizontal, vertical and even a sunburst satin finish. This along with some high polished attributes really give the watch tremendous character that can not be justified in pictures. 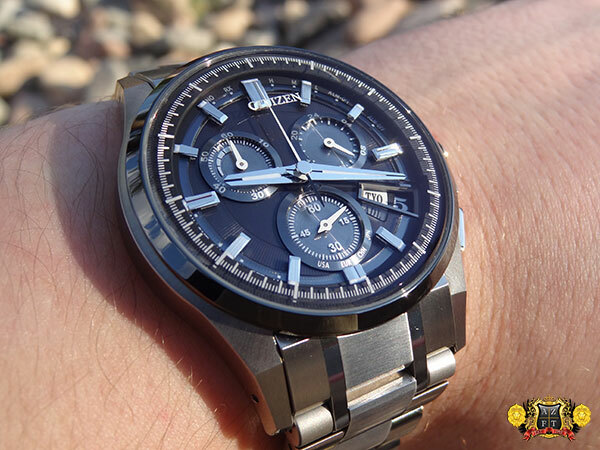 Adding to its incredible design, Citizen uses a cylindrical titanium roller in the bracelet at each of the lugs. They call this their Gyro Fit, and it is actually used for comfort as opposed to a cool look (which it has anyways). 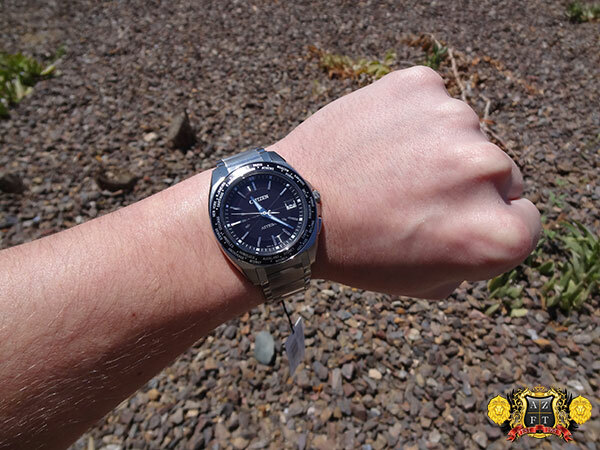 The Gyro Fit aspect allows for better curvature around the wrist as well as feel, but this is not the only feature that makes for a more comfortable timepiece. The dual push button deployment clasp has a micro-adjustment that can be easily adjusted without the use of any tools. By pushing the buttons of the clasp and pulling the bracelet from the 12:00 side, you can easily change the length of the bracelet without even taking it off of your wrist. 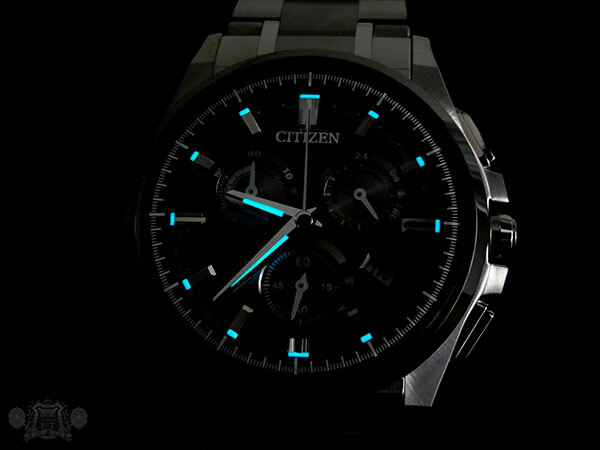 Citizen also uses a cool blue luminescence on this piece making for great visibility at night. While it has lume for complete darkness, the finish of the hands, indexes and even chapter ring give a great glimmer, adding even more legibility in low light settings. The overall fit and finish on this piece are truly incredible, and have no lack of attention to detail. The BY0094-52E measures out at 44mm wide, about 14mm thick, and weighs about 95g. The reason for its thickness is mostly due to its deeply domed, dual curve, anti-reflective coated, sapphire crystal. 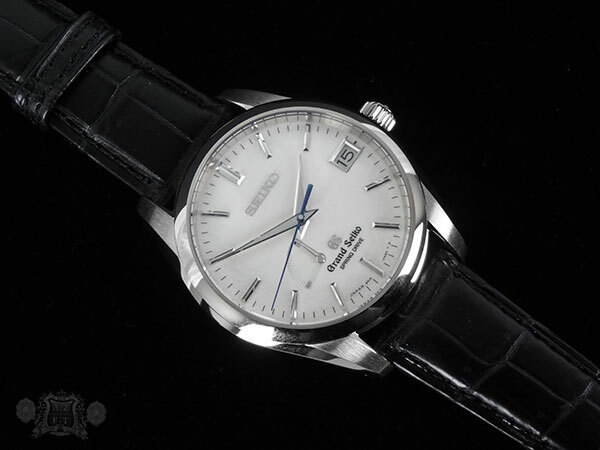 The crystal has the Citizen logo attached making for the floating appearance above the dial. 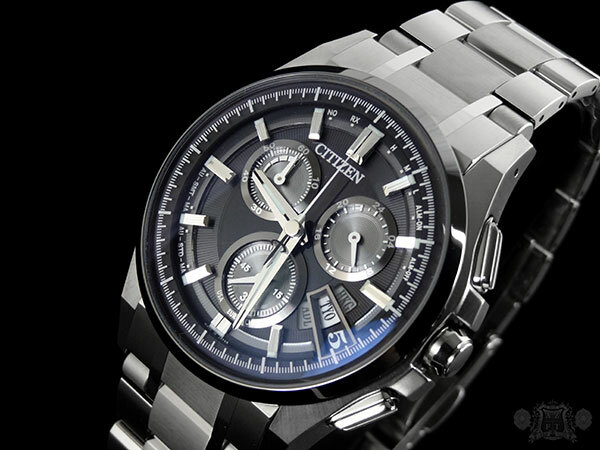 This 3D attribute adds much depth with a perfect Citizen shadow resting on the dial. Attesa is a new addition to the AZFT roster, that took years of work to bring in. We are very proud to have them finally in our store for people to see first hand. 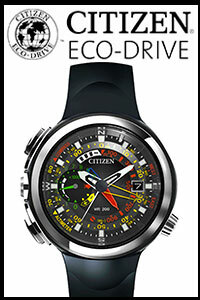 The series includes 5 different models, all of which will have Citizen USA’s 5 year manufacture warranty. Due to strict policies and only small quantities being available, this item will not be found on our website. 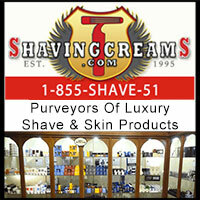 If you have any questions or wish to obtain one for yourself, please feel free to contact us at 1-800-486-3996.